Posted on 01/15/2019 , updated on 01/24/2019 by KWLS Admin. 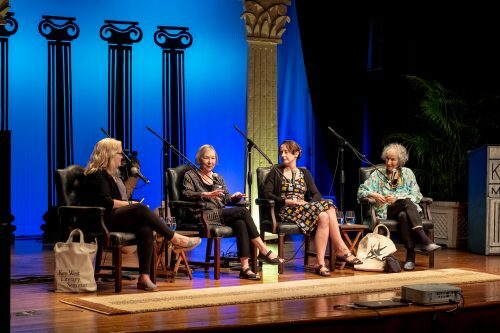 Margaret Atwood, Valerie Martin, and Emily Wilson engaged in a wide-ranging discussion of “Wives and Maids, What do They Know? Equal Rights for Minor Characters,” moderated by Kate Tuttle. Atwood began the session with an invocation from her Penelopiad and then discussed her impetus for writing the novel: anger at the unfairness of the murder of the twelve maids in The Odyssey. This feminist perspective was an undercurrent for the entire discussion. Tuttle posed the seminal question of what makes a minor character minor, and the three writers discussed the issues of characters’ positions in society, specifically servitude. Atwood speculated that the maids in The Odyssey would likely not have had a choice in their sexual activities with the suitors but were still punished for their “wrongdoing.” She likened the plot point to an honor killing in which Odysseus and Penelope would have felt compelled to “clean up the dirt,” and cleanse their house of the maids’ actions. Martin added that, as a translator, precision in diction was key and that the maids were not truly servants but slaves who were murdered, not executed. This led to another question by Tuttle about how writers make minor characters real and significant in their narrative roles. Martin brought up her eponymous Mary Reilly, for whom servitude was a kind of salvation, a way to save her from worse fates which makes her character more fully rounded than simply that of a servant doing her duty. Being in a subordinate position, Martin said, does not mean a minor character is unimportant and doesn’t have his or her own role to play, and it also doesn’t mean that the minor character doesn’t have a story of her own to tell that transcends stereotypes. The discussion then shifted to the topic of power structures and how minor characters are often in roles in which they have little, if any power. This, Martin said, makes for interesting perspectives. Tuttle brought up the role of the wives in Atwood’s The Handmaid’s Tale and how, like Mary Reilly, their restrictive and repressive roles in society were seen by the characters as the lesser of evils. When asked where she found her inspiration for the minor characters of the wives, Atwood quipped that we don’t have to go far back in history to see women being oppressed. Women not allowed to handle their own money or have rights over their own children, she stated, is part of our recent history. Questions from the audience ranged from Atwood’s role in the Hulu production of her Handmaid’s Tale (she says she is an “executive consultant,” a role she describes as having no power and limited influence), to the “necessity” of having the maids executed for Telemachus’s political security — to which Wilson responded that political expediency is not the same thing as justice. The final question was whether any of the authors felt guilty about minor characters not having more voice, and Martin reflected that a minor character’s plight in a prior work was what led her to write her latest novel, Property. It was clear from the authors that there is nothing small about minor characters and that they play an integral role in helping complete a narrative structure. The authors shared that they felt a sense of responsibility to ensure that the fictional women who fill in the backdrop of their worlds are characterized with respect and with agency, especially where female characters are concerned. Andrea Rinard is a veteran high school English teacher in Tampa, Florida and a novitiate in the order of writing. You can listen to their discussion here. This entry was posted in event coverage and tagged 2019. Bookmark the permalink.